but you will need a passport. Click here for more information. Theme: Nature, wildlife, citizen science. £650 per week for lessons; £150 per week for host family accommodation. Location: Isle of Mull, Scotland. Maximum class size: 8 students to 1 teacher. Minimum class size: 1 student to 1 teacher. Lessons per week: 25 hours, Monday-Friday, plus group and pair work. 13:45-14:45 Field walk, observation, discussion. Students do a one-hour homework assignment before each teaching day. Length of course: One, two or three weeks (Saturday to Saturday). Time of year: 2019 dates are 6 April to 28 September. Lessons and lunch: £650 per person per week. Accommodation: £150 per person per week if you stay with a host family. 5 days of English lessons, teaching materials, administration and lunch. Lunch is usually a picnic near the beach (sandwiches, soup, fruit, etc). 7 nights' accommodation with a local host or host family, including breakfast (toast, preserves, fruit juice, porridge, coffee), 5 evening meals (Sunday-Thursday), and Internet access. Tall waterproof boots ("wellington boots"). Travel from your home to Isle of Mull. See below. Guest house, commercial bed-and-breakfast, luxury self-catering or hotel (instead of host family accommodation). If you prefer to make your own arrangements, we can give you a tourist accommodation list, and refund any money you paid for host family accommodation. Friday and Saturday evening meals at local pubs. Local tourism services such as whale-watching, visit to Treshnish Isles, bicycle hire. These are independent businesses, not connected with Linguetic. UK visa if you are not from the European Union. See FAQ page. You travel independently to the Isle of Mull. We meet you at Mull's southern ferry port (Craignure) on Saturday evening, and we take you back to Craignure on the morning of your final Saturday. Mull is an island 200km and 4 hours from Glasgow Airport. The journey is magnificent; it goes past lochs and mountains, forests and castles, and there's a 20-km ferry trip to the island. You may see dolphins, seals, deer or eagles on the way. Glasgow Airport (GLA, sometimes called Glasgow International Airport) is 13km west of the city centre. There are direct flights to GLA from nearly 100 European airports, plus İzmir, Antalya and دبي (Dubai). Alternatively, you can fly to GLA via any London airport. By public transport: Take a bus from Glasgow Airport to Glasgow city centre. You can take the 500 Glasgow Airport Express (21 minutes, £8.00, book in advance or pay on the bus). Then take either a Scottish Citylink coach or a ScotRail train to Oban. The coach and the train both cost £35-£40 return, and most services take about 3 hours 15 minutes. The Citylink coach goes from Buchanan Street bus station. The train goes from Glasgow Queen Street railway station. The train is more frequent and has been voted "Most Scenic Railway Journey in the World". Find train times and prices at National Rail Enquiries. Or with a hire car: You may want to rent a vehicle at Glasgow Airport, so that you have a hire car for the whole of your stay in Scotland. At the airport, there are Hertz, Avis, Alamo, Enterprise, Budget or Thrifty. Near the airport are Sixt and Europcar. You don't need to go into the city of Glasgow. From Glasgow Airport, take the M8 and M898 / A898 to the Erskine Bridge, and continue along the A82 west towards Loch Lomond and the Trossachs National Park. It should take you about 2 hours to drive to Oban. 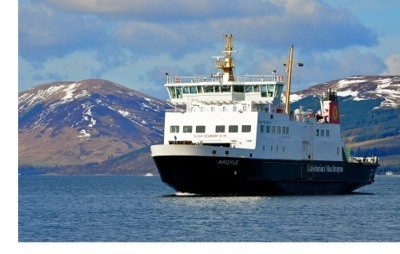 There are ten CalMac vehicle/passenger ferries per day from Oban to Craignure in summer. Oban is a nice small town, and the ferry terminal is at the town centre. If you are a foot passenger, you probably don't need to book in advance. A return ticket is about £8. If you have a vehicle, you should buy a ticket in advance. It's about £35.00 for a car and driver. Click here to go to the CalMac website, where you will find the Oban-Craignure ferry in the "Inner Hebrides" group of services.